I have so many "serious" topics in my head, but none of the energy required to do really write about them the way I need/want to. Instead we get this, my to do list. I guess some people would call it a Bucket List, but that seems a bit morbid to me. This is more casual, the things I think would be fun, and the next time I see them I'm totally going to do them list. 1. Ziplining. Jethro and I got really close to doing it a few years ago, and then we saw the price tag and said nope. Next time though, it's on. 2. 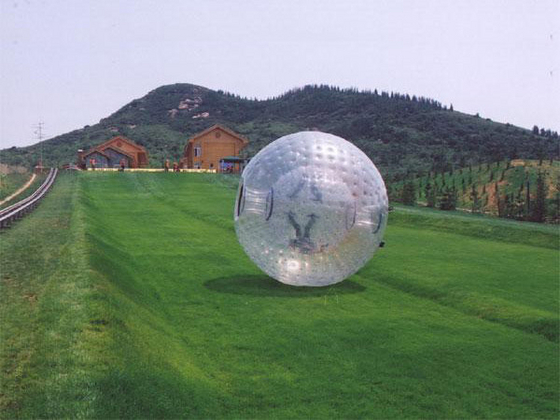 Zorbing - I realize most people have no clue what this is. It was on an episode of Road Rules once (shut up, you know you watched it). Think a air filled hamster ball with a person inside. You can zorb on land, you can zorb on water. I think I'd prefer land. Weeeee!!!! There's a person in there. I'm sure they're just fine. 3. Parasailing - But not near any buildings, and not where there are sharks in the water below. I've got stipulations! 4. 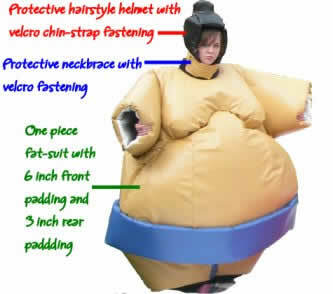 Fat costume sumo wrestling - This looks like the most possible fun. 7. Go on vacation - Like a real vacation. With a beach, and fruity drinks and a man servant.... ok maybe not a man servant, no wait wait yes, a man servant. Guess I need to start squirreling away some money huh? Yay! I love lists. It's so cool that you want to go to the Olympics. I don't think I've ever had a dream that big. Go get it, man! Lists are my favorite :-) I'm semi-obsessed with the Olympics. You get to see another part of the world plus athletics? I'm in. Since the USA and the international Olympic committee aren't friends right now it'll probably be some time before the games come back here.